Congratulations mom-to-be, you’re expecting! Now, what should you expect? Being pregnant is an exciting time filled with many physical and emotional changes. For instance, you may become more emotional, crave crazy food, notice changes in your skin, hair, and nails, or feel nauseous. These changes are completely normal, and are to be expected. In fact, during your pregnancy, from beginning to end, one thing that you should anticipate is this: change. What skin changes should I expect? Changes to your skin during pregnancy can be attributed to pregnancy hormones. When you’re pregnant, your body produces hormones faster than normal. We’ll cover these hormones in detail later in this article, but for now, know that they’re responsible for the changes in your skin. For example, these hormones can increase the number of oil glands on your face, boost your body’s blood volume, and increase the production of skin pigment. But don’t worry. At Arizona Dermatology, we’re here to help reverse the signs of these common pregnancy skin changes. Read on for more information on these conditions, or simply schedule an appointment to receive a consultation for your specific skincare concern. The linea nigra is one of the most common skin change when you’re pregnant. It’s the vertical line on the stomach, stretching from the belly button to the top of the pubic area. The linea nigra will appear towards the latter half of your pregnancy, typically around week 23. Contrary to popular belief, you’ve always had this line on your stomach—you just haven’t been able to see it. Prior to your pregnancy, the linea nigra isn’t noticeable because it blends in with the natural color of your skin tone. However, when you’re pregnant, your body increases its production of skin pigment, thus darkening the line. Unfortunately, the linea nigra is unavoidable to most. You can prevent the line from darkening by staying out of the sun and wearing sunscreen. Besides that, the only thing you can do it wait. For most women, the linea nigra fades on its own after the baby is born. According to The American Pregnancy Association, pruritic urticarial papules and plaques of pregnancy, or PUPPP, occurs in 1 out of every 150 pregnancies. It appears as an itchy, bumpy rash and commonly develops on the stomach in stretch marks. Fortunately, this skin condition is benign, meaning non-cancerous. However, although harmless, PUPPP can be an irritating and frustrating skin condition to live with. To reduce the itching sensation caused by PUPPP, try switching to non-irritating clothes, and gentle soaps and cleansers. Taking an oatmeal bath and soothing your rash with aloe vera are also two methodologies that can help soothe this skin irritation. If these at-home remedies don’t help with the rash or the itching sensation becomes a nuisance, we recommend consulting with your dermatologist. Depending on your case, they may prescribe a prescription medication or ointment to soothe the itching sensation. On average, 90% of women experience stretch marks during their pregnancy. Stretch marks are pinkish, reddish streaks that are found on your skin. They’re caused by the rapid pull, growth, and stretch of your skin. They commonly appear on the abdomen and breasts, but may also appear on any region of the body where you gain baby weight. Most likely, your stretch marks will fade to faint lines after the delivery of your baby. However, if you still have distinct stretch marks after birth, we suggest treating them with dermatologist-approved lotions and ointments or undergoing laser resurfacing treatment to improve their appearance. In addition to other skin changes, pregnancy is also a risk factor for skin tags. Skin tags are small benign tumors that appear as smooth flaps of skin. When you’re pregnant, you have a higher likelihood of developing skin tags due to hormonal changes that are taking place within your body. Cauterization: A device gently burns areas of the skin to remove the skin tag. Cryotherapy: The treatment uses liquid nitrogen to freeze the growth. Excision: The skin tag is gently removed using a scalpel. No, the “pregnancy glow” isn’t a myth. In fact, the glow is actually completely true—and scientifically proven. The glow you experience while you’re pregnant doesn’t reflect how happy or joyful you are, but rather reflects the amount of blood circulation in your body. When you’re pregnant, your body produces 50% more blood circulation than normal. This increase in blood flow causes your face to become brighter, aka the “pregnancy glow.” In addition, this glow can also be attributed to your hormones. Your hormones are working in overdrive during your pregnancy. These additional hormones can produce extra oil glands, leaving your face looking oily and shiny. Most women don’t mind the look of the “pregnancy glow.” However, if you have naturally oily skin, this newfound glow may be too much for you. If so, we recommend switching to an oil-free facial cleanser and looking into receiving a gentle and safe chemical peel. If you have a problem with acne already, your pregnancy may cause your pre-established symptoms to flare up. However, if you don’t commonly experience breakouts, your pregnancy can still cause acne to appear. Your hormones and oil glands are responsible for the acne and other breakouts you may see during your pregnancy. The logic behind this is simple. When you’re pregnant, your body produces more hormones. Hormones produce more pores. These additional pores secrete more oil than normal. The increase in oil production leads to acne and breakouts. You should treat the acne associated with pregnancy the same way you treat any other form of acne. Consult with your dermatologist first to establish a strict daily cleansing routine involving fragrance-free, irritant-free cleansers. Finally, the last skin change you should expect while you’re pregnant are veins. Specifically, there are two common veins that usually develop during pregnancy, varicose veins and spider veins. Varicose veins are bulky, blueish veins that commonly appear on your legs or feet. While you’re pregnant, your body tries to compensate for the extra blood flow that’s going to your baby. This results in damaged blood valves that can become uncomfortable or painful. To avoid varicose veins, we recommend walking as much as possible to improve blood flow and circulation to your heart. On the other hand, spider veins appear as small reddish blood vessels that branch outward. Like varicose veins, spider veins are also caused by the increase in blood circulation. However, contrary to varicose veins, spider veins do not hurt. Rather, patients tend to complain about spider veins strictly from a cosmetic standpoint. Usually after delivery, spider veins tend to slowly disappear. If not, a laser treatment can help improve the appearance of these veins. To prevent spider veins from forming, try taking Vitamin C and avoid crossing your legs to help increase blood flow. What causes these changes during pregnancy? The various physical and emotional changes you experience during pregnancy can be attributed to the hormones in your body. Your body produces a wide variety of hormones at a rapid rate, causing changes you’ve never experienced before. Follicle stimulating hormone (FSH): The first hormone you’ll experience during pregnancy. FSH is present before you conceive and helps control the production of eggs by your ovaries. Luteinizing hormone (LH): This hormone works with FSH to coordinate your menstrual cycle. Human chronic gonadotropin (hCG): hCG is present once the egg meets the sperm. It suppresses your immune system, amplifies the production of estrogen and progesterone, and supports the growth of your baby. Estrogen: This hormone helps your uterus grow and your baby develop their key organs. It also works to trigger the production of other key hormones in your body. Progesterone: This hormone plays the important role of keeping the uterus muscles relaxed. It also can result in high blood pressure, heart burn, dizziness, and nausea. Relaxin: During pregnancy, women can have 10 times the normal amount of relaxin in their body, which helps loosen ligaments, muscles, bones, and joints in preparation for labor. Placental growth factor: This hormone is responsible for the increase in blood volume. Human placental lactogen (HPL): HPL is produced by your placenta. It works to adjust your body’s metabolism to feed your baby. It also helps prepare your breasts for breastfeeding. Oxytocin: This hormone is present during your entire pregnancy. It stimulates labor contractions when it’s time to deliver your baby. Prolactin: Prolactin handles your breast development. It causes your breasts to increase in size and prepares them to produce milk. These hormones are responsible for all the changes to your body, including the changes to your skin. For more information on the impact of these hormones, we recommend skimming through this cheat sheet for pregnancy hormones. During your pregnancy, it’s perfectly normal to experience a wide range of physical and emotional changes. This is to be expected, so try your best to remain calm and at-ease with these changes. 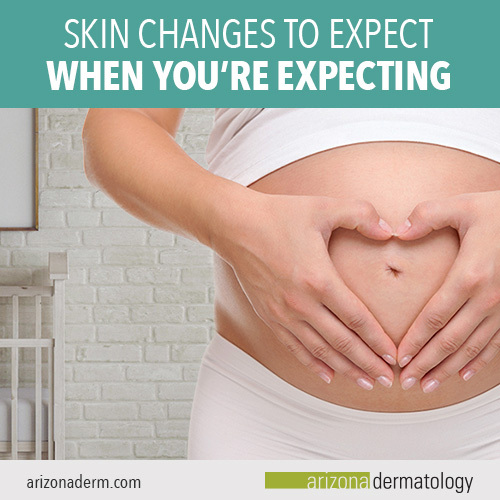 However, if your pregnancy skin changes are irritating, frustrating, or impact your quality of life, turn to the experts at Arizona Dermatology. We’ll help you tackle your most pestering skin changes so you can get back to concentrating on what’s important—the health of you and your beautiful new baby.